The Middle East is home to millions of refugees and displaced people who have been forced to flee the violence sweeping their region. Many of these refugees are children. Some have lived as refugees for their entire lives. These children don’t know when they’ll be able to return home, and they are desperate for hope for their futures. But they live in a Bible desert … where they have no access to God’s Word. You can share that hope with a child through an illustrated storybook Bible. 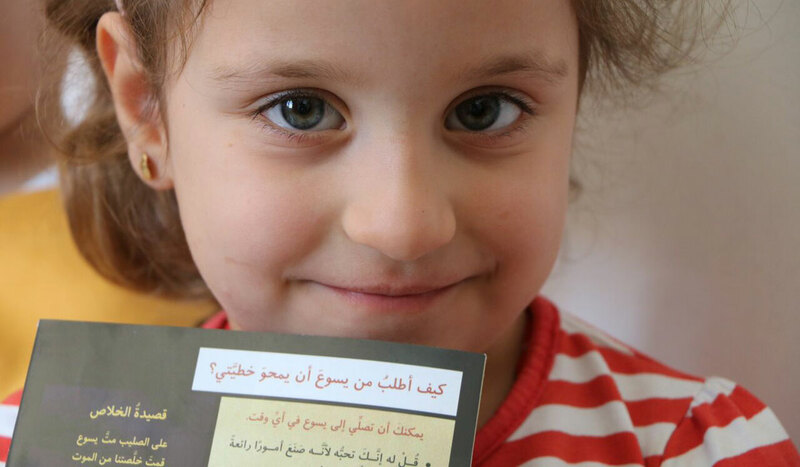 Our partners are ready to flood the refugee camps of the Middle East with storybook Bibles. These illustrated storybook Bibles provide the truth of the Gospel in a format perfect for children. And it only costs $1 to print and distribute a Bible that will reach up to four children. Our partners in refugee camps are waiting to receive storybook Bibles so that they can put Gospel hope into the hands of the youngest refugees. You can help share the Gospel with a child today. For just $1, you can provide a storybook Bible that will transform the life of up to four children. These children have had their lives overturned by evil and violence. But you can bring hope and joy into the chaos when you send a storybook Bible. An entire generation of Middle Eastern young people is waiting. You can make a difference … one child at a time. Send a storybook Bible today and change lives for eternity.